At 12 years old, this musician is a veteran of the craft. You will hear Gabriel Angelo, long before you ever see him. The sound of his trumpet ricochets off the buildings in downtown San Francisco, guiding you to an impeccably dressed 12-year -old, blowing a horn and tap-dancing like an old-time vaudevillian. “I also consider myself a philanthropist, and a gentleman,” Angelo says, adding another layer to the already complex picture. Since taking up the trumpet six years ago, Angelo has turned the city streets into a stage. He’s performed outside San Francisco Giants’ games, dressed sharply in uniform of course. He’s entertained shoppers in Union Square, seniors in senior homes and entire church congregations. Angelo has already met many of his heroes – jazz trumpeter Arturo Sandoval and saxophonist Branford Marsalis, who asked him to play a tune(trumpeter Wynton Marsalis once called him to lend encouragement. ) Someday, he hopes to be as world famous as them. “What this is all about is helping me to tune up my career and really making connections,” Angelo says with all the moxie of a business networker. When the day ends at the Oakland private school he attends, Angelo and his mother take BART to San Francisco. He carefully chooses a spot to play - foot traffic is a must. The trumpet comes out, the fedora is tilted back, and “Putting on the Ritz” spills out of his horn. After a couple a measures, the trumpet plays second fiddle to a tap dance routine that can only be described as Michael Jackson meets Fred Astaire. When the dancing stops, he begins to chat-up his new found fans. Most of the money Angelo makes busking is already spoken for. 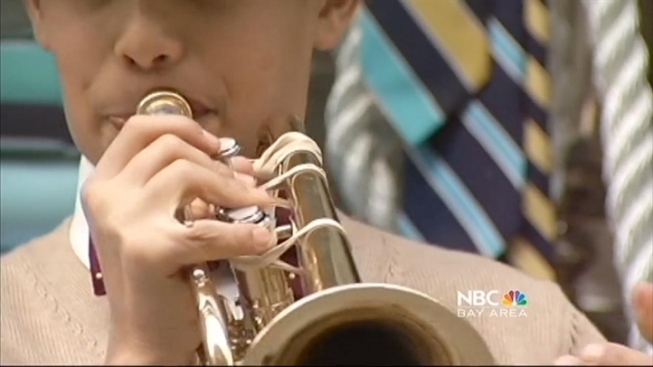 There are music lessons to pay for, and classes at San Francisco’s Conservatory of Music. Leftover funds go toward his other passion – h has a preference for Brooks Brothers. With a red bow-tie, a straw fedora and his favorite Brooks Brothers shoes, Angelo cuts a dapper figure. He pushes back the sleeves of his button-down sweater, grabs his horn and blows the theme from Rocky. A crowd of shoppers looks-on as he begins to dance, as if going toe-to-toe with Sly Stallone himself. When the time is right – something only a seasoned performer can sense – Angelo packs the trumpet back into its case. He and Teresa walk toward BART to begin the journey home -- there is homework to do.